DOES irony leads us anywhere valuable? How does cultural postmodernism fit in? 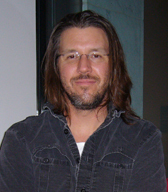 These are questions guest columnist Lawrence Christon gets into today, extending a much-discussed essay by David Foster Wallace (pictured). The subject keeps popping up. Newsweek, The Economist, Salon, The Atlantic, more than once in Slate. The general tone about irony is that it’s become the general tone, not just of artistic expression and cultural discourse, but of everyday life. Wink-wink. Double-entendre. Air quotes. The snide remark, the sitcom comebacker. Nobody asks ,“What’s the catch?” anymore. Is it because everything, one way or another, is the catch? a new pathology. How new is it? Aristophanes formalized it. Socrates used it, even at his own trial. Cervantes made a parable of it. Swift broadened it into a human meta-condition. Societies gripped in rigid social and political hierarchies made it obligatory, as with Moliere, La Rouchefoucauld, Shaw, Wilde and Gogol. If not hierarchies, then conditions. Joseph Heller made “Catch-22” a universal reference for rational lunacy. So did, unwittingly, Donald Rumsfeld (and the Bush II administration’s proclamation of its own reality). What’s the difference between contemporary irony and the O.E.D definition: “A figure of speech in which the intended meaning is the opposite of that expression used by the words, usually taking the form of sarcasm or ridicule…” and ”A contradictory outcome of events as if in mockery of the promise and fitness of things”? It isn’t always just snark. Irony is mutable. It’s a base for comedy’s conjunction of the irreconcilable. It’s a philosophical posture toward intractable hypocrisy, as in Camus’ line, “The tragedy of America is that the appearance of justice conceals the reality of injustice.” It’s a nimble form of self-reparation, of psychic release from the inescapable. That’s where postmodern irony comes in. Pop culture is the inescapable condition, culminating in the 1990s, when low culture and high culture went to war in a horrible mismatch in which the high was seized and condemned, not to death, but scorned irrelevance. And not just culture, incidentally. In “Amusing Ourselves to Death,” Neil Postman warned that the way things are going, mere derision and not force of arms will be enough to overthrow governments. If irony is the new quotidian, it’s been building for a long time. Pound, Auden, Mumford, Dada and the Absurdists. George Trow of “The Context of No Context.” Warhol, the idiot savant, whose Delphic utterances seem somehow fitting in an era when cultural authority crumbles before the fatuous sneer, and there’s no one to explicate what’s phony and what’s real. In what other age have we had something as absurd as the reality show, whose mere category is an oxymoron? People have complained about means of communications before, beginning when epics and legends were written down instead of memorized. But nothing has gone farther than commercial television to cheapen and exploit every basic human value out there while bleeding into the general category of Media, which has colonized the consciousness of generations. Now we have TV’s extension, ubiquitous screens, to mirror the phenomenon. “America is great…it’s the individual that’s dead,” said Paddy Chayefsky in 1976’s “Network.” That may still be a premature post-mortem, but the relentlessness of a monetized, celebrity-driven, factionalized, out-of control, in-your-face, warp-speed world has given us no place to go except in the shifting crawl space of irony. Let’s take it for what it is, no longer a development, but a chronic symptom. What does it say about art and the people who make it, aka the creative class? Irony is detachment. Art is engagement. Right now they’re in a toxic mix. The article Lawrence wrote is a rush of fresh air into the dead space I call Art Hell. I am a artist and new to Arts Journal … So I don’t know if you publish Lawerence on a regular basis … If you don’t … You should. “The times they are a changing” this article is proof that artists may soon retake the territory they wittingly or unwittingly gave up. It is time for the artist to distance theirselves from the “Art World” gate keepers and reclaim “The World of Art”.